BAGHDAD / Nina / The head of the Department of Banking and Finance Ministry Hilal Taan diminishing quantities of central bank reserves of gold does not affect the price of the local currency. He said in a statement to the National Iraqi News / Nina / today: "The basket cash reserve covering currencies do not include the gold only, but depend on the dollar and the pound sterling and the euro, in addition to gold bullion." He said: "The Iraqi dinar has been a week before the beginning of the deal by one of the sites of the U.S. because of the high currency reserves to more than $ 67 billion is evidence that the Iraqi currency backed by a strong balance can not be influenced by declining gold bullion." He pointed out that "the dinar traded in global financial directory sites on the recovery of the currency and that there is a future for the Iraqi dinar and would soon return to what it was before 1980 because of the global demand in the global financial markets." The Iraqi Central Bank denied reports by the media about the low reserves of gold, stressing that it saw stable over the past several months. He said in a statement yesterday he was "no truth to the news reported by some media on the low bank reserves of gold," stressing that the reserves now total 29.790 tons. there is a future for the Iraqi dinar and would soon return to what it was before 1980 because of the global demand in the global financial markets." "The Iraqi dinar has been a week before the beginning of the deal by one of the sites of the U.S. because of the high currency reserves to more than $ 67 billion is evidence that the Iraqi currency backed by a strong balance can not be influenced by declining gold bullion." "The Iraqi dinar has been a week before the beginning of the deal by one of the sites of the U.S.
"the dinar traded in global financial directory sites on the recovery of the currency and that there is a future for the Iraqi dinar and would soon return to what it was before 1980 because of the global demand in the global financial markets." Currency unit consisting of 1,000 fils or 20 dirhams. When officially introduced at the end of the British mandate (1932), the Iraqi dinar was equal to, and was linked to, the British pound sterling, which at that time was equal to US$4.86. Iraqi dinar (ID) equaled US$4.86 between 1932 and 1949 and after devaluation in 1949, equaled US$2.80 between 1949 and 1971. Iraq officially uncoupled the Iraqi Dinar from the pound sterling as a gesture of independence in 1959, but the Iraqi dinar remained at parity with the pound until the British unit of currency was again devalued in 1967. One Iraqi dinar remained equal to US$2.80 until December 1971, when major realignments of world currencies began. Upon the devaluation of the United States dollar in 1973, the Iraqi Dinar appreciated to US$3.39. It remained at this level until the outbreak of the Iran-Iraq War in 1980. In 1982 Iraq devalued the dinar by 5 percent, to a value equal to US$3.22, and sustained this official exchange rate without additional devaluation despite mounting debt. 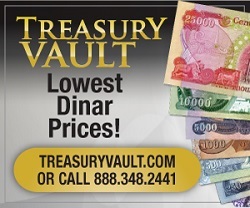 In early 1988, the official dinar-dollar exchange rate was still Iraqi dinar (ID)1 to US$3.22; however, with estimates of the nation’s inflation rate ranging from 25 percent to 50 percent per year in 1985 and 1986, the dinar’s real transaction value, or black market exchange rate, was far lower-only about half the 1986 official rate. 1986–2003 between .33 cents to 1.32 to a dollar. In october 2003, the official Dinar-dollar exchange rate was ID1 to US$0.00027. As of Jan 1st 2006, the official Iraqi dinar-US dollar exchange rate is ID1 to US$$0.00067. Good article, thank you for posting. Lets hope they get off their tails and make it happen.